A couple months ago, I wrote about the Guns of Seneca, which were the strange booms that occasionally happen around here. In continuing in that same vein, I had a flashback to the summers of my youth and the mysteries I saw over Lake Ontario while it was cloaked in darkness of those warm nights. I'm talking about the lights on the lake. If you live near the lake, you might already know what I'm about to tell you. When I was 12-15 years old, I used to stay with my grandmother regularly over the summers. She lived in Lyndonville, about five miles from Lake Ontario. Once in awhile, she’d get a call in the evening after dark from a friend who lived along the lake. The lights were on the lake. So, we’d get ready and head out to check out the spectacle. At the end of Route 63 at Shadigee, there would be a dozen or more cars parked to check out these mysterious lights that appeared to be floating halfway across the water. For some reason, the lights seemed to be most prevalent during the time period of 1986-1990. We went out several times to see them. What were the lights on the lake? They didn’t look like they were far enough away to be Toronto, but they definitely resembled a cityscape, complete with moving vehicles. Maybe it was some sort of reflection of the city from the clouds? It was a mystery that drew many people to the shores of the great lake. I used to dream that there was a lost city in the middle of the lake that sunk beneath the waves hundreds if not thousands of year before in an attempt to escape the perils of the world. Every once in awhile, the city would resurface to see how the future was faring in their absence. After determining that the rest of us still needed more time to mature, they would sink beneath the water again. So, what is the deal with the lights on the lake? A story from Rochester in 1871 may shed some light. On a beautiful, sunny day in April, 1871, visitors to Mount Hope Cemetery caught sight of a very unusual phenomenon. When they looked off toward Lake Ontario, they were astounded when they realized they could see the northern shore of Lake Ontario in vivid detail. People could see forests, structures, and Canadian landmarks, easily identifiable despite the intervening distance of 50 miles. A MIRAGE SEEN AT BUFFALO, NY – The people of Buffalo NY were treated to a remarkable mirage, between ten and eleven o’clock, on the morning of August 16, 1894. It was the city of Toronto with its harbor and small island to the south of the city. Toronto is fifty-six miles from Buffalo, but the church spires could be counted with the greatest ease. The mirage took in the whole breadth of Lake Ontario, Charlotte, the suburbs of Rochester, being recognized as a projection east of Toronto. A side-wheel steamer could be seen traveling in a line from Charlotte to Toronto Bay. Two dark objects were at last found to be the steamers of the New York Central plying between Lewiston and Toronto. A sail-boat was also visible and disappeared suddenly. Slowly the mirage began to fade away, to the disappointment of thousands who crowded the roofs of houses and office buildings. 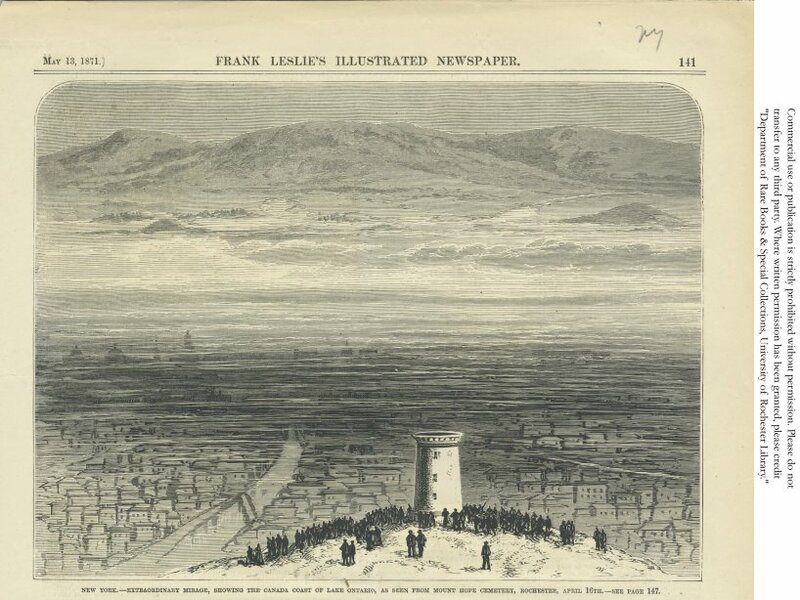 A bank of clouds was the cause of the disappearance of the mirage. A close examination of the map showed the mirage did not cause the slightest distortion, the gradual rise of the city from the water being rendered perfectly. It is estimated that at least 20,000 spectators saw the novel spectacle. 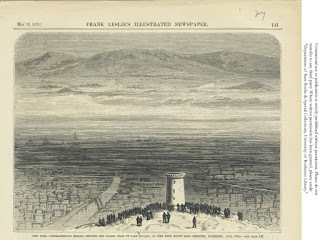 This mirage is what is known as that of the third order; that is, the object looms up far above the level and not inverted, as with mirages of the first and second orders, but appearing like a perfect landscape far away in the sky. Apparently, the phenomenon is known as a Fata Morgana, an unusual form of mirage. It is named after Morgan le Fay, the enchantress from the Arthurian legend. Supposedly, le Fay used her witchcraft to lure sailors to their deaths with castles appearing in mid-air. A Fata Morgana occurs when rays of light are bent as they “pass through air layers of different temperatures in a steep thermal inversion where an atmospheric duct has formed.” Basically, it’s an optical illusion where the light is bent in such a way that objects far beyond the horizon appear visible and magnified. While this seems to take some of the mystery away from the lights I saw as a teen, there are still some questions as to the lights on the lake. I only saw this happen at night. Can a Fata Morgana happen at night? I would imagine so. There must have been a series of perfect atmospheric conditions prevalent 1986-1990 that gave us a grand view of Toronto appearing in the middle of the lake. I still like the idea of an ancient secret civilization nestled snug at the bottom of the 800-ft deep lake. I’m guessing that someday that could be a story I could write. In the meantime, does anyone who lives along the lake still see the lights on the lake or Toronto in vivid detail?